Hope everyone had a nice Thanksgiving (or a nice Thursday, if you live outside of the US). Many people are heading out to the stores bright and early so here are a few TV items you can talk about while waiting in line. A new As the World Turns DVD is being released for the holidays, some familiar faces are returning to Desperate Housewives, a tragedy on the set of the G.I. Joe sequel, the owners of Lassie are suing, and the sequel to JJ Abrams’ Star Trek movie has a release date. Plus, a few interesting bits of TV history. Missing the classic soap opera? If so, then Soap Classics has a holiday gift for you. 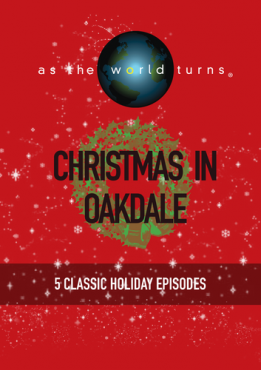 The company has announced the release of “Christmas in Oakdale,” a compilation of five memorable holiday episodes from ATWT’s 54 year history. It sells for $12.95 and includes select episodes 1985 through 2007. Soap Classic recently released 20 ATWT Classics which includes 20 of the soap’s most memorable programs. As the ABC series winds down, several former castmembers are planning a trip back to Wisteria Lane. Body of Proof star Dana Delany will reprise her role as Katherine and Kyle MacLachlan (Orson) and Andrea Bowen (Julie) will also reappear. It’s unclear how many episodes each will have. A crew member has died on the set of the feature film sequel, G.I. Joe: Retaliation. Mike Huber was reportedly working on a high-powered scissor lift when it tipped over. He later died from his injuries. In a statement, Paramount said that they were cooperating with local authorities and expressed condolences to the Huber family. G.I. Joe: Retaliation is filming in New Orleans and is scheduled to be released June 29th. The JJ Abrams sequel has been given a new release date. The as-yet-untitled feature will be a 3D movie and will be released on May 17, 2013 — four years and one week after the first Abrams Trek. That one grossed $79 million in its opening weekend and $258 million during its North American release. 2008: The Shield ended its run on FX after seven seasons and 88 episodes. 1999: Carol Hathaway gave birth to twins Tess and Kate on ER. She and the girls’ father, Doug Ross (George Clooney), eventually married and worked together at the University of Washington Medical Center. 1996: The Loveline call-in program debuted on MTV. 1990: Comic Strip: Live, which televised stand-up comedy acts in front a live audience, debuted on FOX. 1958: The New Adventures of Charlie Chan premiered in syndication and ran for 39 episodes. What do you think? Who would you like to see return for the final season of Desperate Housewives? Do you like the idea of the new Star Trek movie being released in 3D? Are you more likely or less likely to see it? JG wentworth needs to quit taking advantage of the weak and needy offering them only a fraction fo their Annuaties! Im still waiting for a Class Action!